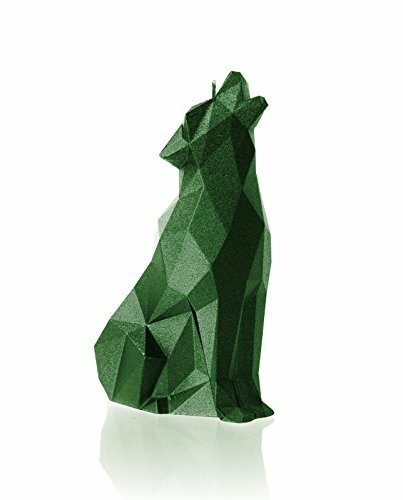 Package includes one unscented minimalistic wolf shaped candle in geometric low poly style decoration, a great centerpiece to have at home to burn or appreciate- it will sure be a conversation topic among friends, family and guests. Excellent for pet lovers or any men or women who enjoy original creative gifts that are so unique, all your friends will have that giant genuine smile when receiving one of those. The best value: Our candles entices the curiosity of all the fellows who will be dying to burn them, but will be extremely hesitant to do so after all, who wants to light a candle so pretty and fun? If you wish to burn it, it usually goes up to 45 hours. Made with all natural non-chemical renewable wax using a 100% cotton wick. Our candles are kid and pet-friendly because is completely paraffin-free and dye-free, so it burns cleaner than any candle you can find. Carefully designed, hand poured and painted in Europe with extreme love and passion! We use 100 pct European raw materials. Satisfaction guarantee: If you don't like our candle, just let us know and we will refund your purchase. Made in Europe.